Quienna Broadnax is the founder of the nonprofit organization Santa Barbara Young Black Professionals (SBYBP). She is an alumna of the University of California, Santa Barbara (UCSB) and works for the County of Santa Barbara as a certified Property Tax Appraiser. 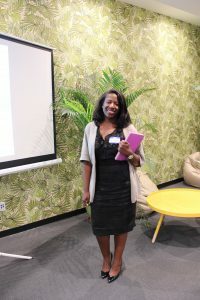 Broadnax recently sat down with Quinisha Jackson-Wright, Communications Officer at the Santa Barbara Foundation, to share more information about SBYBP and her thoughts on broadening the connections among young black professionals in the Santa Barbara Community. QJW: Can you start by telling us how the idea came about to start Santa Barbara Young Black Professionals (SBYBP)? QB: I’ve been in Santa Barbara for 10 years, and initially moved here to attend UCSB. After I graduated and got a job here, I noticed as a person of color—specifically, as a black woman—there weren’t many people in the community who looked like me. Around 2015, I noticed an influx of young black professionals in Santa Barbara, which inspired me to start an organization for our community [in 2016]. Together we network, support each other, and strive to excel in the community. Over time, we decided to officially become a nonprofit, which has allowed us to connect and share resources with other organizations in Santa Barbara County. QJW: Since its start in 2016, what do you think has contributed to SBYBP’s growth as an organization? QB: The two main vehicles have been social media and word of mouth. Our first few mixers got people excited to have events specifically for this demographic, and they went on to tell their friends and families about it. Then we started coordinating more meetups and created a Facebook group, which helped to reach new people just moving to the area. I think a big factor of the expansion is due to young black professionals being in need of a space to network and engage with their peers. QJW: A major concern in Santa Barbara County is the cost of housing and how expensive it can be for working class individuals. Does SBYBP share affordable housing resources with local residents? QB: Honestly, affordable and decent housing in Santa Barbara is a major concern – with it, there’s a quality of life; without it, despair and insecurity. It is a major factor in why we cannot attract or retain our young professionals. Right now, most of our efforts to help SBYBP members with housing have been through word of mouth. If anyone knows of housing availability, that information is passed on through our SBYBP email updates. Beyond that, we would love to explore more tangible resources. I’ve experienced the struggle of looking for affordable housing, so I know it can be a shock for new residents moving to Santa Barbara. I think the community as a whole is still working on a more permanent solution, but sharing information on a case-by-case basis is helpful. QJW: What projects does SBYBP have planned to further engage with the community in 2019? QB: We put together a Black History Month program in February 2018 which consisted of three to four events highlighting members in our community, so we will be looking to expand that this year. We want to focus on social networking, personal and professional development, and community service. We are also seeking to form partnerships with other local organizations and businesses. We have value to add to the community, and we want to make it known that we’re here and willing to interact. With that said, increasing our visibility will be a top priority. QJW: Are there organizations SBYBP has partnerships with currently to broaden networking and inclusivity of individuals from diverse backgrounds in Santa Barbara County? QB: Yearly we work with the Martin Luther King Jr., Committee of Santa Barbara as well as the Santa Barbara International Film Festival, so we will continue growing those relationships. The Fund for Santa Barbara has also been incredibly gracious to us and we love their values of standing for change over charity. Our goal is to network with different organizations, see how we align with them, and show the value we add to the community. Many of our members bring fresh views, fresh talent, and fresh insight. We want to create opportunities for young black professionals who are transitioning from here to other places, and also for those who want to establish roots in Santa Barbara and make a lasting impact. QJW: What are some ways you want to help young black professionals thrive in Santa Barbara County, despite circumstances they may face either personally or in their careers? QB: I think contributing to any fulfillment that people get during their time in Santa Barbara, whether it’s social or professional, is a sign of success. I’ve met people who initially didn’t believe they could go far in their career or personal life when they first moved here, but still achieved small goals along the way. If you were able to save money while living here, or grew socially, those are successes. Everything may not be perfect, but the goal is to help people find what they need in this stage to set them up for success in the next stage of life. As SBYBP grows, we want to create an alumni network to maintain connections for those who have moved out of Santa Barbara and those who are moving into the area, and continue the spirit of community and belonging.